Has anyone got any advice as to what to buy for our home needs? Brands to look at or avoid, companies who you've dealt with? 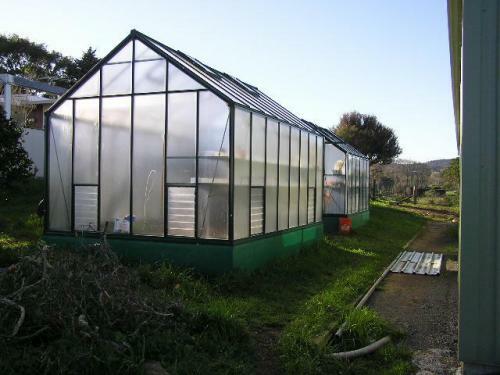 I want to give hubby a glasshouse/greenhouse for his birthday next month and need a bit of help to work out what is best to buy for growing mainly veges and herbs etc. Breeding & training quality Spanish horses - THE horse of Kings! Also breeding Arapawa & Pitt Island sheep. Don't by a cheap polycarbonate one from trademe, a nightmare to put together and a couple of hours of wind to flatten it. We are in a very high wind load area so it won't be one of those! In a high wind zone, I can only suggest as above, have it built to your specs. Not all sides need to be glass so it can be added to an existing building. I just got two trailer loads of green house quality plastic from the last mini tornado that went through Whenuapai about 6 weeks ago and took out two professionally built plant houses. We are also in a high wind area, although the green houses have a little shelter between the house and the shed. However they did withstand the tornado from a few weeks ago. They have a unique glass insertion method which gives some protection and it's toughened glass. They are a little dearer than some other commercial brands, but come with auto openers on the roof and side louvers for good air circulation. You'd be welcome to come and look at ours if you wish. Just PM me. I might add that the proposed site for our new greenhouse will be sheltered to the south behind the 5m high Leyland Cyprus shelterbelt which in turn has my shed and tackroom behind it along with another 5m high shelterbelt, and the westerly side of the site has the 2 storey house nearby. The only prevailing wind it will catch will be from the easterly direction as the entire S / SE side of the house site is well sheltered from that nasty SE wind, and the rest of the house site has shelterbelt hedges on all sides apart from the easterly one. It should end up getting full sun for most of the day depending on where we end up putting it.